Back in September of last year, I was starting to feel a bit restless. I realized that I had absolute masses of use-it-or-lose it vacation time and that the end of the year was fast approaching, so I turned to the internet and started looking into all the places I want to go, places with decently priced tickets, places with good weather, and anywhere with pretty landscapes on Instagram. And then I had to step away from my computer because I went into information overload and gave myself a headache. When I was sufficiently recovered, I realized that one place kept jumping out at me throughout my research: England. So, I decided to focus my search there and see what I could come up with. England has always been one of my favorite places, from my childhood when I was a castle and King Arthur obsessed daydreamer, to when I was 13 and lucky enough to move to London for a couple of years, and ever since. Even as I’ve spent more and more time in Scotland, England continues to have a hold on my heart (shoutout to one of my favorite bands from those magical tween years in the UK!). In the past few years I’ve been trying harder to see new places, instead of going back to places I’ve already been, but there are so many places in England that have been on my Dream to-do list for years, so this seemed like a good chance to get back to place I love and check some new things off my list. When my family was living in England, we took a weeklong holiday to Cornwall and Devon and, as a King Arthur fanatic, I was absolutely beside myself with excitement. 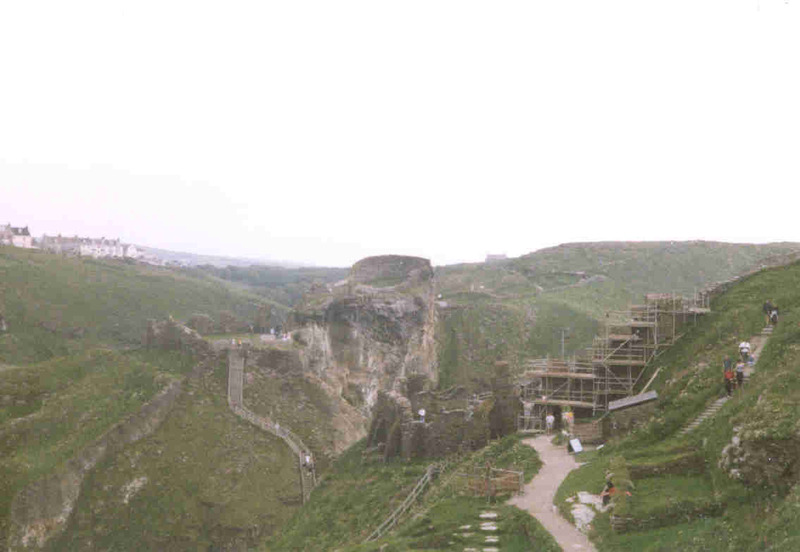 I wandered around in awe of every ancient stone and could barely contain myself at both Tintagel and Slaughterbridge. 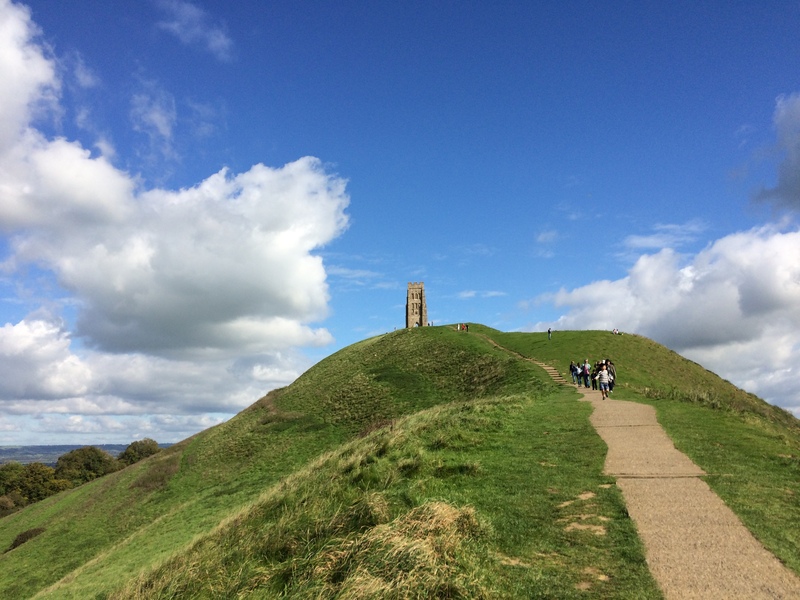 The trip was going to culminate at Glastonbury Tor…and then we ran out of time. Suddenly it was time to get back to London and back to school and I never made it to Avalon. My poor little heart was broken and not even reading and re-reading my new favorite book (Taliesin by Stephen Lawhead) could console me on the drive home. Anyway. Back in 2017 I, definitely not still sad and bitter about this giant injustice of my childhood, realized that maybe this could be my chance to finally get to Glastonbury! 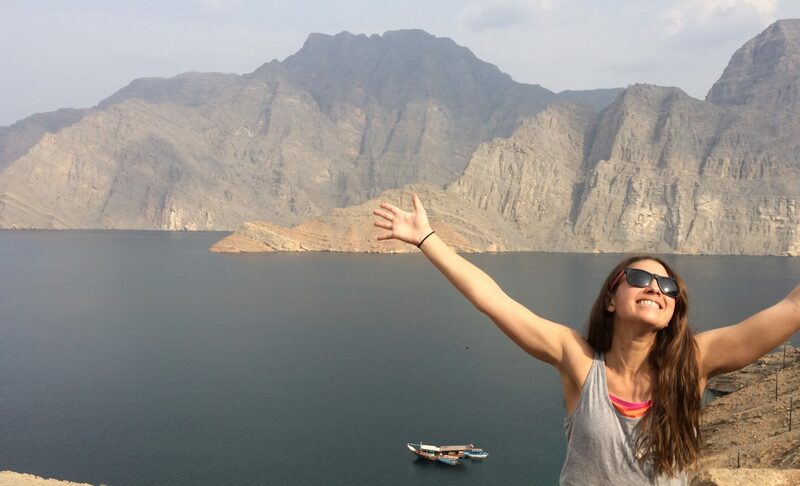 And throw in a few other new destinations while I was at it! A road trip, maybe?! 10 days later I found myself in the Enterprise car rental lot at Bristol Airport, having successfully navigated another WOW flight, standing across the counter from Allen (may or may not be his real name). Allen was very nice, but he was also very clearly calculating the likelihood of both me and the car surviving the whirlwind, five-day trip from Glastonbury to Plymouth and back I had planned. Allen looked skeptical. Still, Allen was a professional and after letting me know that he wouldn’t close out my transaction until I was SURE I didn’t want the GPS, he led me outside and told me to wait while he brought the car around. And then it was my turn to be skeptical. I’m 5’2 and I was travelling by myself with only carryon luggage, and I’m moderately familiar with British roads so I wasn’t expecting anything big. 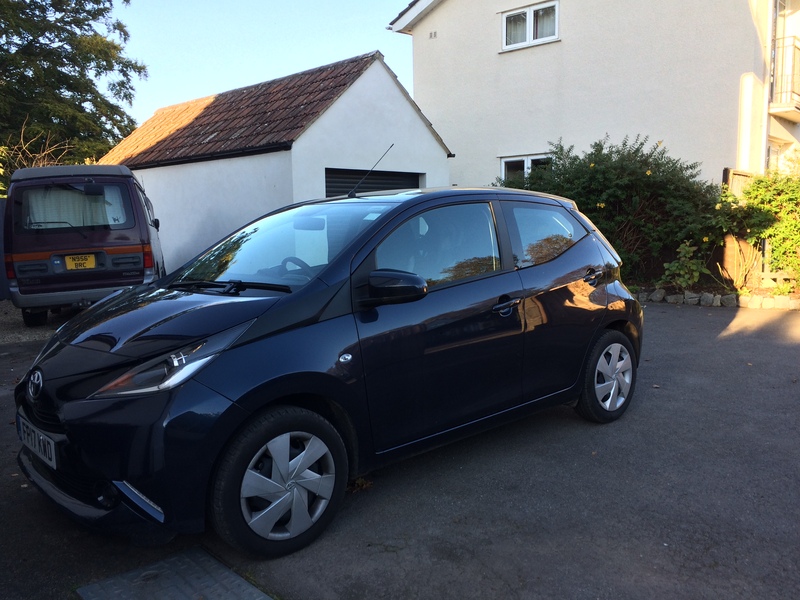 But I also wasn’t exactly expecting the little Toyota Aygo Allen brought around – mostly because up until that point I was unaware that the Toyota Aygo is a thing that exists. Allen gave me some final instructions (eg, I now know that in the Aygo, drive is “E,” although I don’t know why), and then went back inside to help the next customers. I loaded up my suitcase (which took up the entirety of the boot [is it still a boot in a hatchback? ]), turned on my GPS…and nothing happened. So, it was back inside to Allen who pulled out a rental GPS suspiciously quickly, as if he knew this would happen. He handed it to me with a quick nod, and barely a break in what he was telling the next family in line, and I went back outside. 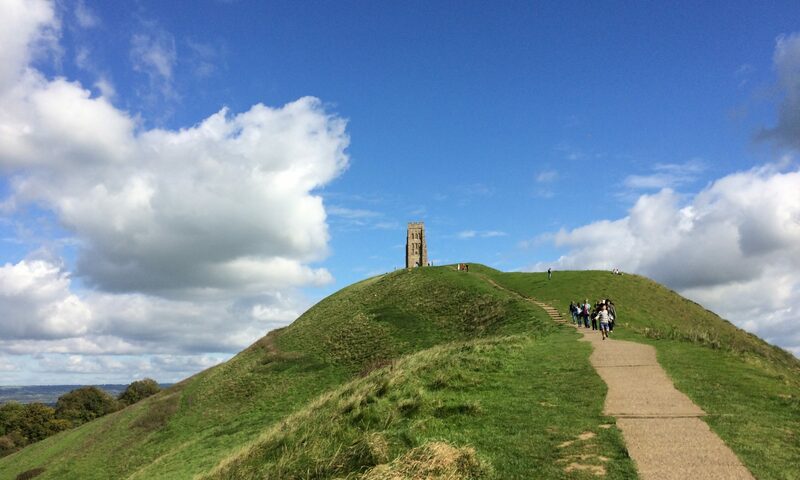 I turned on the GPS, put in the address of my Glastonbury B&B, turned the key….and nothing happened. Oh Allen? It turned out that when Allen backed the car over to me, he left it in reverse when he turned it off, and I hadn’t realized so hadn’t thought to check if it was in neutral before trying to start it. No problem, GPS on, car in neutral, key turned….and nothing. At this point I was starting to get concerned. How could such a little car be so problematic? How could my 16 years of driving leave me so unprepared for the mysteries of the Aygo? What would I do when Allen wasn’t there? Allen, by the way, was starting to look like he would rather be anywhere else. It turns out that the ease with which Allen stopped the car in reverse should have been a clue – the Aygo, as far as I can tell, has no “park” gear. To stop, you put it in neutral and use the handbreak. So, the final problem I was encountering was that I, not being someone who frequently uses the handbreak, had forgotten to disengage it before trying to drive. This took a few minutes (that felt like an eternity) to figure out, because Allen would get into the car, release the handbreak, and start it up. Then he would stop, handbrake, and get out to let me try, at which point I wouldn’t think to do anything with the handbreak and so nothing would happen. We cycled through this more times than I care to admit, before Allen figured it out, gave the car one more sad lingering look as though it was the last time he expected to see it intact, and sent us both out into the world. Spoiler: The Aygo and I, after bonding intensely over B roads and a few other design quirks, did in fact both make it back alive. And who was sitting behind the desk when we did, but Allen! He hid it well, but I know he was thrilled to see me again. Joking aside, Enterprise was great, the Aygo was everything I needed (and then some), and Allen was so incredibly nice and helpful. I would absolutely fly to Bristol, rent from Enterprise, drive an Aygo, and interact with Allen again! The initial rental experience may have been a bit of a rocky start (entirely on my end), but it kicked off a trip that was pure happiness.